Note: Just want to download free green screen software? Just click the banner at the bottom. It doesn't matter if you take just a few shots at special occasions or if you are well known for having your camera with you at all times, everyone wants to take really great shots that look like they came from a professional. The Green Screen Wizard will help you take great-looking photos using Chroma key technology, a technique for mixing two images or frames together, in which a color (or a small color range) from one image is removed. Download Green Screen Wizard. The full version offers the latest in green and BLUE screen software power and control behind an amazingly simple and accessible user interface. It provides professional photographers, as well as photography enthusiasts, a simple way to do green screen removal and substitutes their choice of digital background. 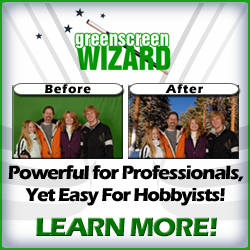 Green Screen Wizard is a self-contained chroma key removal program that does not require Photoshop or other photo editing application to produce beautiful green screen photos. By the time your name is called, there has been yelling at unruly, hungry, and bored children. The clothes need be straightened out and hair redone. There may or may not be cooperation with the photographer. After all that, you get to pay high fees to get enough copies of the photographs that they keep the copyrights to. There is a great product that allows you to take your own photos with a green screen and put that photo on a number of different backgrounds: Green Screen Wizard can be purchased for the same cost as a single session and print package with a professional studio. The added advantage of the Green Screen Wizard is that you own all rights to your great photographs. Green Screen Wizard Professional offers the all the features and benefits available in the Full Version 4.0 with additional capabilities intended for those who demand the greatest flexibility in green screen photography. With the new Batch Capability and Gallery Mode, Green Screen Wizard Pro provides professional photographers a platform for doing business. The Pro Version offers five layers to create amazing images and supports the new sandwich overlays. It has a full annotation capability that will let you put as much text as you like on your images. With this feature you can create advertisements or your own magazine covers. Green Screen Wizard adds some new special effects that makes creating artistic images a breeze. Individuals who love to have professional photographs but want an affordable alternative can use this program. Amateur photographers can use the Green Screen Wizard to start making money with their photography. Professional photographers will be able to expand the services that they provide to their clients. Everyone will be able to do it at an affordable price! Batch is a popular feature. It's not like normal batch process where a file is merged or processed, Green Screen Wizard Pro 4.0 gives you the ability to take two sets of files, a foreground set and a background set, and multiply the two together (5 backgrounds x 3 foregrounds = 15 photographs). This provides a quick set of photographs to choose from for personal use or as an added service for professional photographers to offer. If you have a camera, you should get the Green Screen Wizard as soon as you can, to expand your photography horizons.